Archived posts from category "Visualization"
I have found D3 extremely useful for creating dynamic plots on dashboard style websites for monitoring data pipelines. This looks an excellent resource for learning it. Candidates include the traditional boxplots used by statisticians as well variations and a stack of histograms. I think violin plots, suggested by a commenter, are a nice compromise showing the full distribution. Part 2 (of what promises to be a four part series) of the great comparison of Google Maps and Apple Maps by Justin O’Beirne. See part 1 before starting with part 2. This is an example of using a clever color key that doubles as a histogram showing the distribution of the corresponding areas. By the way, this post is from a great series about small ways to make better visualizations. 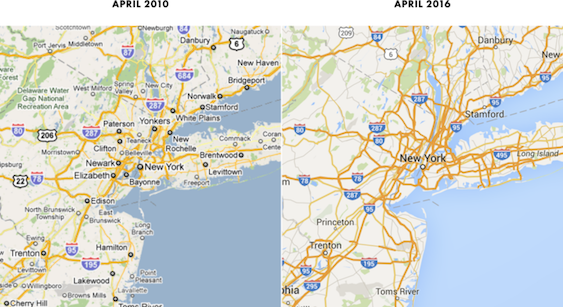 This is a great article about the change in balance between cities and roads in Google Maps between 2010 and 2016. Even though it’s from the early 1960s, the old map is more balanced than the Google map. 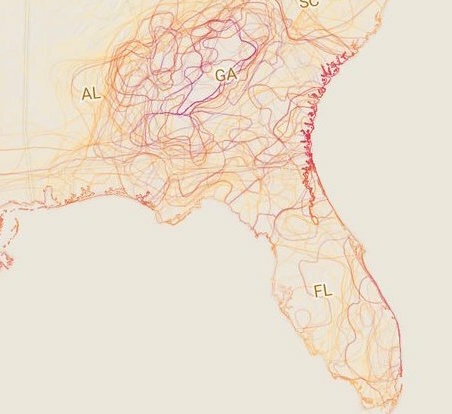 There are a lot of visualization lessons to be learned from cartography. Inspired by a series of posters, I wondered what did my favorite books look like without words. Can you tell them apart or are they all a-mush? In fact, they can be quite distinct. Creating scientific graphics can be difficult: most scientists and engineers lack training in design, deadlines are tight, compromises must be reached between team members and management, and the available tools may be limited. Fortunately, many design guidelines are simple and easy to execute, which I’ll show by re-designing the following graph, originally presented by NASA at the 2015 American Geophysical Union fall meeting. I would not have removed the inset map of the region because I thought it added useful visual context to the exact lat/lon location in the subtitle, but maybe that is just my unfamiliarity with that area. I also wondered what the graphic would look like if it used a Brewer diverging color table for the colors in each band instead of red for all positive values and blue for all negative values.